Hardback edition of the NIV Study Bible, featuring Dr. D.A. Carson as general editor, built on the truth of Scripture and centred on the gospel message. Text size: 8pt. The NIV Study Bible, featuring Dr. D.A. Carson as general editor, is built on the truth of Scripture and centred on the gospel message. An ambitious and comprehensive undertaking, Dr. Carson, with committee members Dr. T. Desmond Alexander, Dr. Richard S. Hess, Dr. Douglas J. Moo, and Dr. Andrew David Naselli, crafted all-new study notes and other study tools to present a biblical theology of God's special revelation in the Scriptures. Alongside the committee, a team of over 60 evangelicals from a range of denominations and perspectives have contributed to this study Bible, including Dr. Timothy Keller, Henri A. G. Blocher, Sam Storms, David Peterson, Craig Blomberg, Kevin DeYoung & Tremper Longman the third. To further aid the readers' understanding of the Bible, also included are full-colour maps, charts, photos and diagrams. In addition, a single-column setting of the Bible text provides maximum readability. 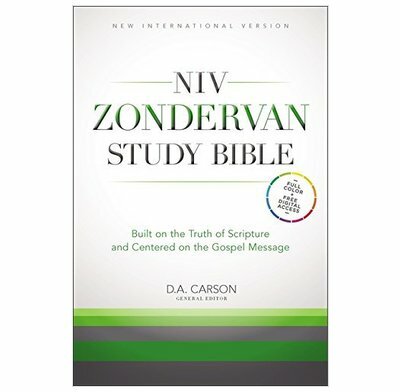 This NIV Zondervan Study Bible is a tremendous tool for informed Bible reading and study. I highly recommend this publication. Let the NIV Zondervan Study Bible equip you for more faithful theological thinking and doctrinal integrity. There are a lot of different types and versions of the Bible and several translations. I myself have about 12 different types and versions of Bibles/study bibles, so why another one, why the Zonevan Study Bible. It is a great addition to have as a study Bible, but like most study Bibles it is comprehensive and a first rate addition even though i still use my other study bibles for different translations and context. The Bible text of this study Bible incorporates the 2011 NIV update, and information one expects such as full colour illustrations, maps (and index), charts and articles throughout as well as a concordance, There is nearly 20,000 all new verse by verse study notes. This study Bible has been well thought through with its editing. it is a great addition to have on your shelf for study. it is 2,890 page study Bible, so quite a large volume. however you do get free digital access for your study bible. For the student, general Bible user and your first purchase of a study Bible, The Zondervan NIV Study Bible is a welcome addition to your library. The book is big and is not for travellers but for home it's fantastic if you have a bible study group also for every individual book of the bible it's a introduction of who wrote and where as well , I'll find this very helpful along with plenty picture of where the story happened . Last important thing to say is that you can download an app to take this book with you . Full of useful comments and brilliant photos, pictures and maps - highly recommended! established NIV Study Bible which presents us with a systematic evangelical theology. But the Zondervan offering also has all the usual notes that explain historical and cultural background and offer interpretive insights. The Bible text is the 2011 NIV update, and it has the usual NIV cross references and the excellent NIV concordance. The chief editor is evangelical scholar Don Carson whose painstaking oversight is evident throughout. Like all Study Bibles, it is a great tool, but you have to know its limitations. It can't replace more thorough commentaries or theological tomes, but for a house group leader or occasional preacher, it goes a long way towards it. This would make a first rate addition to the shelves or any serious Bible student.